Lo did the PlayStation Vita wander through its post release months seeking sustenance and finding only sand! Sony’s lonely handheld wandered to the occasional oasis of originals—Gravity Rush and Sound Shapes soothed parched lips—but it’s mostly suffered from a bad case of the ports (Mortal Kombat, Metal Gear Solid HD Collection). Hark, oh ye burned player that spent heartily at launch! Sony announced a veritable smorgasbord of new Vita games during its Gamescom 2012 conference on Tuesday. Most exciting of the bunch is a brand new game from the crew at Media Molecule, those creative folks behind the Little Big Planet series. 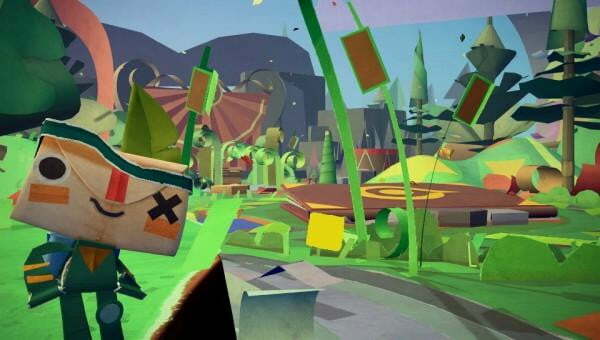 Its first Vita game is called Tearaway (pictured). Where Little Big Planet’s roots were in Super Mario Bros., Tearaway calls back to the Paper Mario series. Its hero Iota lives in a three-dimensional world made of paper but he’s trying to escape into ours. You help by peeling away layers of the paper world with the Vita’s touch screen. Need to attack some enemies? Poke your finger through the paper world by tapping the rear touch screen bopping them. It’s one of the few games that’s tailor built for Vita and looks great as a result. The second original for Vita is less thrilling. Killzone: Mercenary from Guerilla is a first-person shooter like its console siblings and even runs on a modified version of the Killzone 3 engine. The hook is that, as a mercenary, you fight alongside both the good ISA soldiers and the bad, cool-masked Helghast. Missions provide portable friendly structure to the game, much like Zipper Interactive’s ignored Vita shooter Unit 13. Killzone: Mercenary feels like a missed opportunity to revisit the excellent, tactical overhead shooting game Killzone: Liberation, one of the PSP’s very best. Sony, stop trying to make Killzone an FPS institution. It’s not going to happen. Finally, as promised at E3 2012, Sony announced details for bringing PlayStation games to Vita. PSone Classics will be available starting Aug. 28, but only in limited quantities it seems. The same initial line up announced at E3 was trotted out, including Final Fantasy VII, Tomb Raider, Arc the Lad, and others. It still isn’t clear if PSN members will have to repurchase these games on Vita or not. Overall, Sony’s Gamescom line up for Vita is encouraging, albeit lacking in the third-party support that will be crucial to the device’s longevity. Call of Duty Black Ops: Declassified is there, as is Assassin’s Creed III: Liberation, but are they enough to bring in a game playing public whose wallets are already strained?